, large-scale changes across your entire AdWords account became much easier. Today, we are launching keyword bulk uploads to help you add, edit and remove keywords at scale. Have you ever downloaded a keyword report and wished you could make changes to your account directly, without having to upload the report into another tool or go back into the AdWords UI and search for the same keywords you already have in front of you? Now you can. Right in your downloaded keyword reports, you can add, delete, edit, pause, and unpause keywords, and then upload these changes directly into your AdWords account. This feature not only saves you time, but it also provides a new level of flexibility and automation by allowing you to use standard spreadsheet functions and logic to manage your keywords. Here’s an example. Imagine you want to create exact match versions of all your broad match keywords, and you want to set their MaxCPC bids to be 20% higher than their broad match counterparts. You can quickly do this by copying the broad match rows, changing the match type column value, and creating a basic formula to multiply the existing bids by 1.20. Then, you simply upload the entire sheet and AdWords will apply your changes. 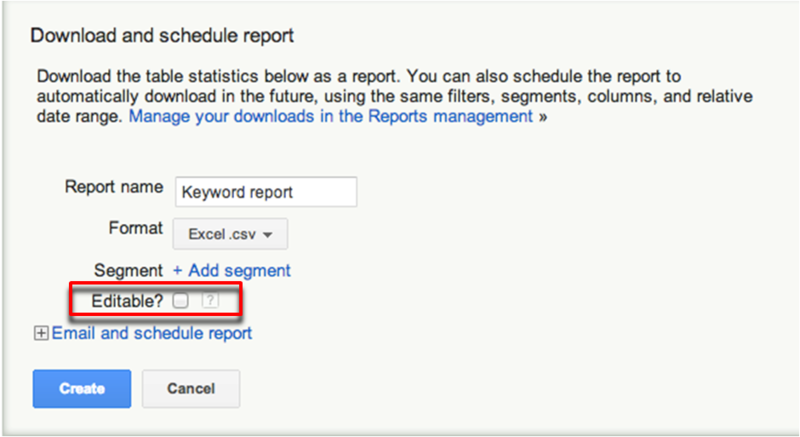 On the same page where you’ve always been able to download keyword reports, click the box that says “Editable.” This will download a special, editable version of the keyword performance report that you can modify and then upload. In order to get the hang of this feature, check out the keyword bulk uploads article in the AdWords Help Center for some basic instructions. Once you’ve finished making your edits, you are ready to save your changes and upload your report. You can save your changes in CSV, TSV and Excel formats. To upload this file, click “Reports and uploads” on the left navigation window, and then click the “Uploads” tab. It’s important to know that once a bulk upload is submitted, there is no way to cancel or automatically reverse your changes. Therefore, we recommend that you always save a copy of your original downloaded report in case you ever need to see what your settings were before you made changes and submitted a bulk upload. You can also view your change history and reverse any unintended changes manually. For more information on keyword bulk uploads, visit the keyword bulk uploads article or discuss in our AdWords Community. With our launch of bulk editing back in November, large-scale changes across your entire AdWords account became much easier. 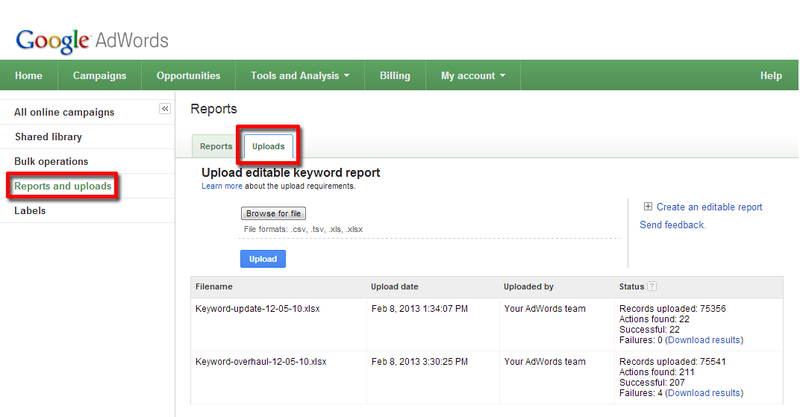 Today, we are launching keyword bulk uploads to help you add, edit and remove keywords at scale.